Online retail giant Amazon is set to expand its Kindle tablet range with the launch of three new models in 2012, debuting two new 7-inch devices and an 8.9-inch tablet that target low, medium and high-end markets. The three models are said to offer varying resolutions, with the low-end 7-inch model featuring a 1024 x 600 resolution, the medium range 7-inch Kindle tablet packing a 1280×800 resolution and its high-end 8.9-inch device sporting a 1920 x 1200 display. In order to maintain low production costs, Amazon is reported to have signed agreements with Taiwanese assemblers Quanta and Han Hai, Prime View and Chimei Innolux for flat-panel displays and Chimei Innolux for its exclusive supply of 7-inch touch sensors. 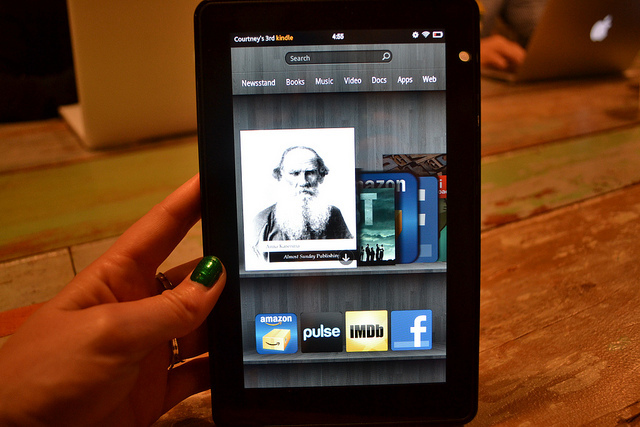 The Kindle Fire — which launched in September 2011 — was assembled by Quanta, which was credited with the design of the tablet. Reports suggested that Amazon wished to enter the tablet market as soon as possible and so contracted Quanta to help them with the look and feel of the device. Taiwan Economic News reports that Hon Hai will assemble the lower-end (1024 x 600) 7-inch Kindle tablet model, with Quanta responsible for the assembly of the medium-to-high-end (1280 x 800) model. In December 2011, Amazon announced it had sold more than 4 million Kindle devices in the weeks leading up to Christmas, becoming the most popular item on the Internet retailer’s stores in the US, the UK, Germany, France, Spain and Italy. Not normally known for divulging sales statistics, Amazon stated that in December, customers bought “well over” 1 million Kindle devices per week, ensuring that in the U.S the Kindle Fire, Kindle Touch and Kindle claimed top three positions in its sales charts.